The Hub waltzes in, fresh off the plane from Portland, Maine where he was visiting his mom for the past four days. He is carrying a medium sized black bag that is not his regular carry-on. He hands it to me, it is very cold. Inside....two beautiful live lobsters!!!! I love lobster and I cannot believe he is so sweet and carted them back for me on the plane today. The cat was especially intrigued as the lobster tried to crawl around on the table. You know, it's so much work to eat the lobster after they've been cooked, but it is SO worth it. All that cracking and squeezing and poking to get every delicious piece of meat from the shell made me think that perhaps this would be a good entry for the "work and play" challenge at Ramblings and Photos this week. The little sea creatures were delicious! Thanks babe, and I am so glad you are home!! oh my gosh, that cat looks like he is just the happiest person on the planet! ha!! These are great! I love a good lobster bisque but I admit that I'm not usually willing to put in the effort when it comes to fresh lobster. Carrying lobsters on a plane...now that is love. The look on the cat's face made me giggle out loud. you can carry live lobsters on the plane??? that is insane that he got those for you and carted them around, alive! crazy! Woah! What a HUGE lobster! and what a great hubby you have there!!! This is perfect for the work & play challenge!!! Lobster from Maine....nothing like it. We aim to please. Portland is about 1/2 hour from me, so those beauties may have come from a nearby trap. While poking through all the shells for the meat is a lot of work-there's nothing else quite like it. 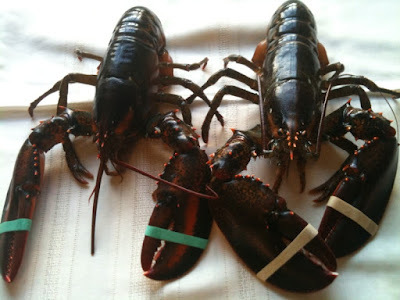 I haven't had my summer lobster yet this year-maybe that's why my mood of late is off. :) Hope they were super delicious. And yes....they actually sell lobster in the Portland Airport. I bet I could get you a better price though. 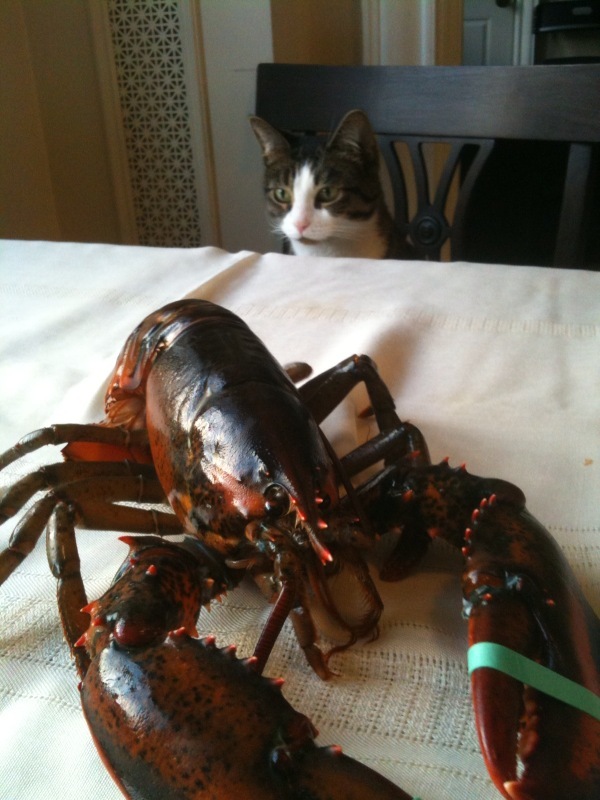 Those lobsters look incredible...I nearly drooled on my keyboard! Love Lobstah! :) Nice photo!